While work is being done on the Fort Edmonton 1905 Street overview, check out the history of the Deadmonton domains. 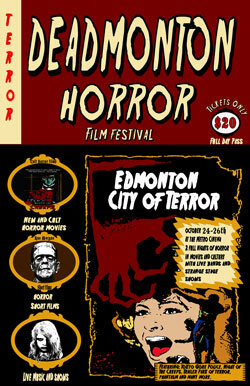 Deadmonton.net was in use as the home to the Deadmonton Horror Film Festival back in 2008. The image at top shows the site banner at that time. The festival held one of the first showings of the film, My Name is Bruce. In it, Bruce Campbell is mistaken for the his character Ash, of the Evil Dead flicks, forcing him to battle a real monster. There were screenings of several other horror classics as well: Night of the Creeps (the first showing of the fun zombie horror comedy, in Edmonton, in over twenty years), Tokyo Gore Police (a crazy, over-the-top gore-fest of a horror film), Phantasm (on 35mm print, no less! ), and more. Home-grown Edmonton films were also on hand. A music night at the Starlite, and a Zombie Walk to the screening of Night of the Creeps, was also part of the horror fest. So check out https://deadmonton.com/horror-film-festival.html and see the line up of the 2008 festival. Also look for the WayBack machine links to get a partial look at what the site in 2008 (here is a glimpse). Deadmonton Horror Film Festival is now Dedfest. The festival continues the great tradition of showing local, classic, and new horror films in Edmonton. Sadly, this could be its final year in Edmonton. Local city council is cutting back funding for other film festivals in favor of the Edmonton International Film Festival. You can always help Dedfest by backing its GoFundMe page. Or ask Edmonton city council to reconsider supporting other local film fests as well. Now back to 1905 Street overview... it should be available by this time next week.